These short topropes are ideal for friction practice. The Goblet, Right is the only well-protected way to reach the central two-bolt anchor. Use this two-bolt anchor when toproping all routes—don’t set up a toprope off one bolt! 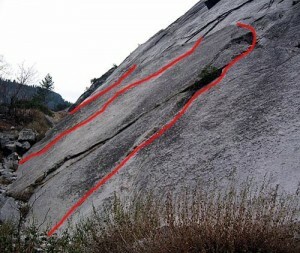 There are two variations to the Left route and many variations to the Center route. Try to find the hardest slab moves you can (there are many 5.6-5.9 variations). Which SuperTopo guidebooks include a topo for The Goblet, Right, Center, Left?